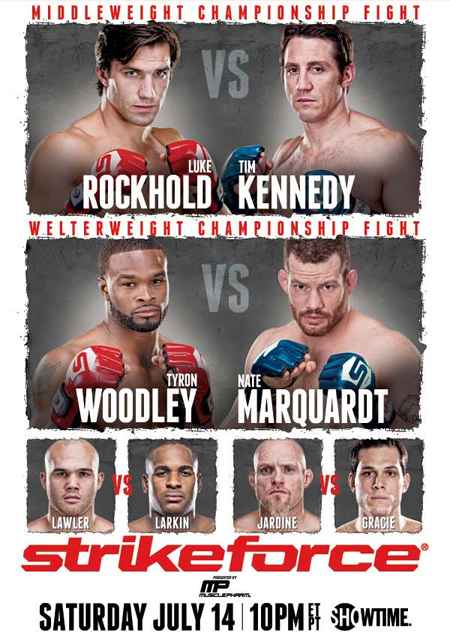 “Strikeforce: Rockhold vs. Kennedy” took place Saturday inside Rose Garden in Portland, Oregon. Spoiler Alert: As customary with all Strikeforce events, only fans with access to an east coast feed can watch the fights live. You have been warned! Showtime Extreme will kick off the festivities by airing five prelims at 8PM ET/PT. Showtime then broadcasts the main card at 10PM ET/PT. A pair of championship affairs will headlined the festivities. Middleweight champ Luke Rockhold defended his crown against Tim Kennedy in the event’s featured attraction, while Nate Marquardt and Tyron Woodley battled for the vacant welterweight crown. 1stRound: Moore dives in for an arrant takedown attempt and gets caught in a guillotine choke on the way down. It’s a wrap. Thanks for coming, Mr. Moore. 1stRound: Great back-and-forth battle. Mein is starting to find his range. He connects on a one-two combo. Stinson’s left eye is bloodied and battered already. Mein tags him with another straight left hand. Mein, 10-9. 2ndRound: Mein lands a right to the body and a left to the head. Straight left followed by a right also scores for Mein. Stinson is getting picked apart with body shots and punches. Stinson gets a takedown but Mein gets right back up. Mein has a little blood dripping from his nose. 10-9 Mein. 3rdRound: Stinson is starting to counter better before eating a combination from Mein. Couple of jabs land for Mein, Stinson counters with a solid left hook. 10-9 Mein. 1stRound: After much jousting, Wilcox gets a hold of a body lock and refuses to let go. He momentarily tripped Masvidal to the mat and still has his back. Masvidal gets free and clocks Wilcox with a flying knee. He’s giving him the business. Wilcox appears to have survived the onslaught, though he’s wobbled. Masvidal hits him again with another flying knee to the grill. Masvidal, 10-9. 2ndRound: Wilcox has regained his senses. Masvidal eats a head kick. Wilcox continues to press the action, while Masvidal is looking to counter. Wilcox gets a brief takedown. Masvidal punishes him with another knee to the mug. Close round to score. Wilcox, 10-9. 3rdRound: Wilcox comes out firing, landing several unanswered punches. Masvidal nails him with a head kick, though Wilcox marches ahead unfazed. Wilcox gets a hold of him and drags Masvidal to the mat with a body lock. Masvidal avoids any damage and gets to his feet. Wilcox, 10-9, and may have rallied for a 29-28 win. 1stRound: Couture dives for a takedown and almost gets caught in a D’arce choke. Couture looks timid with his standup attack. Nothing significant landing for either fighter. Duarte finally connects on a knee and follows up with a takedown with 30 seconds remaining. Couture tries an omoplata off his back, though Duarte gets free. Duarte, 10-9. 2ndRound: Couture secures a takedown within seconds. He has him pinned against the fence and landed a couple of shots before Duarte got to his feet. Duarte scores a quick takedown of his own. Couture tries to steal the round with a last-minute takedown. He takes his back and slaps on a rear-naked choke. He’s now unloading some bombs. Couture, 10-9. 3rdRound: Couture clobbers him with a knee to the midsection. Duarte ducks under a big swing and takes Couture down. Duarte attempts a Peruvian necktie to no avail. Couture manages to wiggle to his feet. Couture plants him on his back with two minutes remaining. Duarte scrambles free and avoided any damage. Couture trips him to the canvas again. That may have sealed the deal. Couture, 10-9, and likely rallied to take it, 29-28. 1stRound: Hirota surprisingly plants Healy on his back. They get stood up due to inactivity. Healy has him clinched against the cage, though Hirota reverses position. Tough stanza to score. Hirota, 10-9. 2ndRound: Healy comes out like a house on fire and eats a big left hook for his efforts. Hirota scores another takedown. Healy gets to his feet, but is pressed against the fence. Healy slams the Japanese veteran to the ground and is active with with his ground-and-pound. Hirota gets back to his feet. Healy, 10-9. 3rdRound: Hirota has him clinched against the cage. The crowd is getting antsy. They exchange leather in the pocket. Healy eats another big punch. Hirota leads his opponent to the ground and connects on a couple of solid punches. Healy takes him back down. Healy, 10-9, and probably leaves with the victory, 29-28. 1stRound: Lawler rocks Larkin with a right hook but can’t finish him off. Larkin trips Lawler and lands some ground and pound. Good combination of punches and knees from Larkin followed by an uppercut, strong finish. 10-9 Larkin. 2ndRound: Larkin has now become the aggressor, taking the center of the cage. Lawler eats a short right that stuns him and opts to clinch against the cage. Larkin drops for a guillotine choke but Lawler rolls around to escape. Larkin throws a head kick that scrapes the top of Lawler’s head and cuts him. 10-9 Larkin. 3rdRound: Lawler starts the round stalking down Larkin. Solid combination thrown by Lawler, now Larkin throws back but nothing lands solid. Pair of rights land for Larkin, Lawler looks to be gunshy. Left hook lands for Larkin, followed by a couple of elbows. 10-9 Larkin. 1stRound: Gracie takes Jardine down and looks to go to work but Jardine gets back up to his feet. Jardine gets put on his back again but this time Gracie gets the full mount and lands some solid elbows that cut up Jardine’s face. 10-9 Gracie. 2ndRound: Another takedown for Gracie as he gets to work on Jardine’s back now. Gracie moves to an arm triangle attempt but it looks like Jardine’s blood made it difficult to finish. Gracie ends the round in the full mount. 10-9 Gracie. 3rdRound: Jardine rocks Gracie with a solid punch combination. Gracie tries to clinch up for a takedown but Jardine slips away. One last ditch effort from Jardine to rush in and land something fails as the bout ends. 10-9 Jardine. 1stRound: Woodley wobbles him with a vicious overhand right and immediately tries to follow up with a takedown. Marquardt drops him with a right of his own. He goes for a guillotine choke, but Woodley manages to escape. They each had a knockdown in the round, though Marquardt controlled more of the action. Marquardt, 10-9. 2ndRound: Woodley is clearly not as confident in his standup as he was prior to getting floored. Just as I type that, he lands a spinning back-fist. Marquardt continues to dictate the fight by controlling the center of the hexagon. Marquardt lands a spinning back-kick to the midsection. He follows up with a straight right and trips Woodley to the ground. Woodley gets back up and tags him with a right. Marquardt, 10-9. 3rdRound: Woodley comes out like a house on fire and unloads bombs on his opponent. He drops Marquardt with a big right and pounces. He’s bringing the pain on the mat. Marquardt attempts an armbar from off his back to no avail. Although Woodley was active with his assault, the referee stands them up. Woodley, 10-9. 4thRound: Marquardt starts things off with a straight right hand. He follows up with an unanswered three-punch combo. Marquardt is laying the lumber against the fence and puts Woodley down for good with a nasty uppercut. Game. Set. Match, Marquardt. 4thRound: Straight left followed by a body shot lands for Rockhold. A big right hook drops Kennedy, Rockhold tries to follow up but he can’t finish. Kennedy tries to take Rockhold’s back but loses position and the frame ends. Rockhold, 10-9.